OST?….Original Soundtrack? I admit to having several songs from SNF on my iPod (both Bee Gees and non-Bee Gees). What a strange moment in time the disco era was! Hadn’t heard of the Heebeegeebees…were they an Aussie or UK phenomenon? The Heebeegeebees were a UK comedy/parody crew. Glad you liked it. Their Status Quid song is terrific too. Well, the first time anyway (just like Quo). ‘Fraid it’s true about the dancing. I still find venues where they assault patrons with their music intolerable and thankfully, now I just walk out. Inflicting my music choices on others, well that’s another matter entirely. I’ve never seen the Sesame Street one before, it’s brilliant. I’ve not heard that ‘Meaningless Songs …’ for hundreds of years. The SNT is a 1537 fave, well about half of it is – I’ve always been partial to a bit of a boogaloo. I remember seeing Sesame Street Fever and passing it up… an unruly decision for sure. I’d also like to see Grover in other, fine John Travolta roles. Danny Zuko, Vincent Vega and Vinnie Barbarino come to mind. Now that would be a fine series. Here’s an admission: this is one of the very few albums that have been filed without being listened to. Oh the shame! 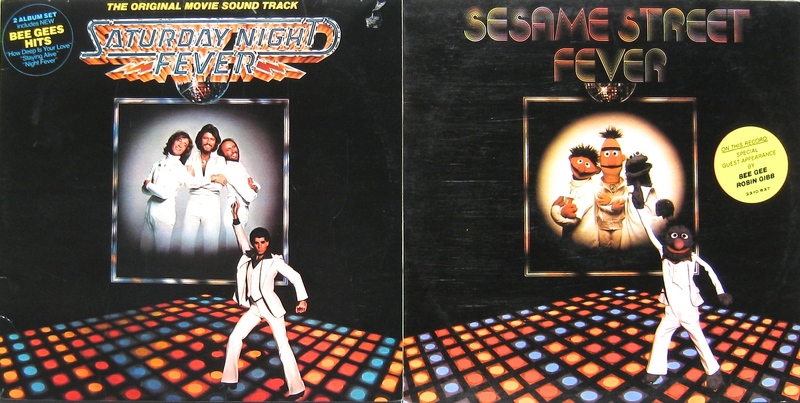 Both the original SNF soundtrack and Sesame Street Fever were in my house while growing up. If hypnotized, I might actually be able to pull up a Sesame Street Fever track from my subconscious, based on the amount of play it got from my then-four-year-old brother. Very funny! Ah, it’s that Yin Yang thing. I’ve not played Sesame Street and you have it burned into your cerebral cortex. Hope you enjoyed the ‘in-head’ replay! I so want the Sesame Street one!